Time to get your Word manuscript for ebook publishing with the Nuclear Approach. It may have taken months or years, but finally, your Word document is ready and has become your final manuscript for your new ebook. Unfortunately, during this long process of typing, making corrections, copy and paste, on top of reviews and changes sent by your beta readers or an editor, the end result may look fine to you on your screen, but in reality your Word document is an absolute mess of background code, so you need to prepare your Word manuscript for publishing. What you see is definitely not what you get with a document in Word. 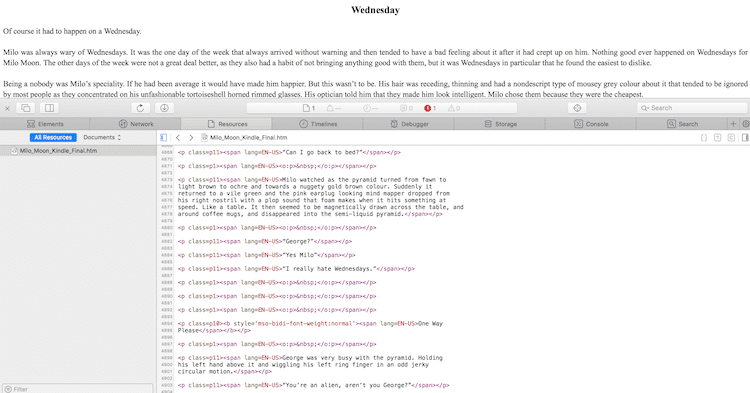 Here is what it really looks like, and why it would be a disaster if it is used to create an ebook. In the upper pane is the view in Word, and below is the code that is used to tell your screen what to display. In this image above, black is text and red and purple is hidden code. There is more code than text. To check your Word document as in the image above, save a copy of your document to .htm. Then open this new file in your browser and select Page Source from the view or developer menu. This works best in Safari, Firefox or Chrome. There will always be code because it is necessary to format your text. However, a lot of unnecessary code can accumulate over the long period of time it takes to write a book. When a Word document is used to be converted to an ebook by Kindle Direct Publishing, Smashwords, Google Play or any other online ebook publisher, it is the code that is read and not the perfect looking word processor text that you see on your screen. Within this code lies any number of errors that have been created during your writing process. These can include irregular fonts, differing paragraph styles, line spacing, and line breaks, as well as hidden information including an author name that may not be you if your Word program was not registered in your name. Yes, a lot of information is stored in Word code, in either .html or .xml depending on what file format you use. So once you think your Word manuscript is ready for publishing, the very first thing to do is clean your text, and start all over again. This is accomplished by converting your whole manuscript, which means every single word, into plain text and copying it back into a new Word document. To do this, select all of the text in your manuscript, copy it, and then paste into a text editor. If you are using Windows, use Notepad, and for Mac users, Text Edit. 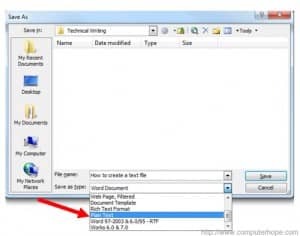 Open a new file in either program and paste the text you copied from Word. Then save it as plain text into a new file. You will then see your manuscript in either Notepad or Text Edit in plain text, which means it is totally unformatted. Now it’s time to move your text back into a new and pristine clean Word document. So, now go in reverse. 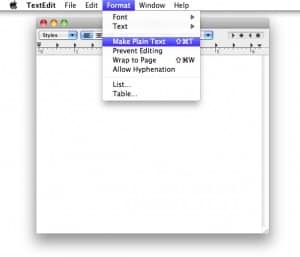 Copy the text in your new plain text editor window and then open a new Word file and paste your plain text into Word. Then save it under a new file name in either .doc or .docx format. DO NOT overwrite your existing manuscript, though! Keep that as your original master copy in case you need to revert to it at any stage along the publishing line. But now, with a new, clean and pristine Word document copy of your manuscript, you are ready to format your book for electronic publishing. 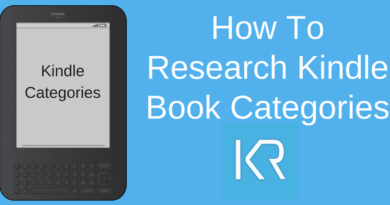 To format your plain text Word document and be ready for uploading to an online ebook publisher, refer to our previous post on How To Format An Ebook and how styles are used to make your book absolutely perfect for ebook readers. As an extra check, you should convert your new Word file into epub and mobi files to check what your new book will look like as an ebook.